I have been making this recipe for years and it is one of my favorite salad recipes. You could literally drink the dressing it is so good. We are having company tonight and this is what I am making. Just in the mood for a good ol' salad. I usually don't make the chicken from scratch anymore but just stop at Hardee's or somewhere and buy chicken fingers and cut up and add to the salad. To me, Hardee's has the BEST chicken fingers on the market right now. Enjoy! Preheat oil in deep fryer or deep pan to 350 degrees. Blend ingredients of dressing with electric mixer. Chill. Beat egg and milk, mix well. In another bowl, combine flour with cornflakes, salt and pepper. Cut chicken into 4-5 strips. Dip chicken into egg mixture and then into flour mix. Fry each finger for 5 minutes. Toss romaine, red and napa cabbage and carrots. Sprinkle onion, almonds and chow mein noodles. Add chicken and dressing. So proud of myself that here it is the middle of January and I have managed to get a gourd painted today. This was so much fun to paint. I have a ton of gourds that need to be painted up so I'm hoping to do that this year. 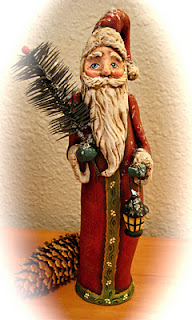 A fun change from painting only ornaments. I had to take the picture outside with our snow since the gourd is of santa building a snowman. 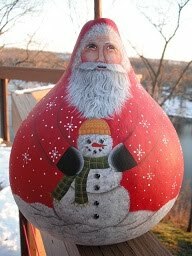 A customer of mine had asked if I could do a santa gourd much like one of my lightbulb ornaments...I think I got it right, even painting a more thorough face. I'm studying some different santa faces to paint this year. So far, so good! I also added a photo of the big snow we got yesterday...our first for the winter season. I don't mind getting it on the weekends when I don't have to drive in it. So pretty and calming. Thanks for looking! Been very busy for many months painting my oak kitchen cabinets white. As you can see the old oak cabinets had an arch on the top ones so we ordered new doors for the top only. I wanted a modern kitchen and I thought the square ones looked more simple and modern. I love clean lines. Plus our old bottom ones were that way anyway. What a process. Now that we have our new refrigerator we found out it doesn't fit right under the cabinet that is there so we have ordered a smaller cabinet for that space so it looks like my painting cabinets project STILL is not over with. UGH! Just this past week we had Granite Transformations come in and put in our countertops and blacksplash. What a difference that makes. My kitchen looks so clean now. Well, except for the floor but we aren't putting in the bamboo flooring until we get a few ceiling drywall projects finished. Such a slow process...worth the wait tho! We are putting the wood floors in the kitchen and our great room which are connected. Will post pics of those when it gets done. We are also thinking about cutting out the middle of my pantry door and a few of the top cabinet doors and adding glass which will add to the modern look. We also have ordered stainless steel door handles that look really modern. I just couldn't wait to share how far we have come. I have attached a picture of what the kitchen looked before we started the whole process and what it looks like right now. enjoy!